booty from a trip to the ocean, originally uploaded by aarn! +9th June, 2008+. 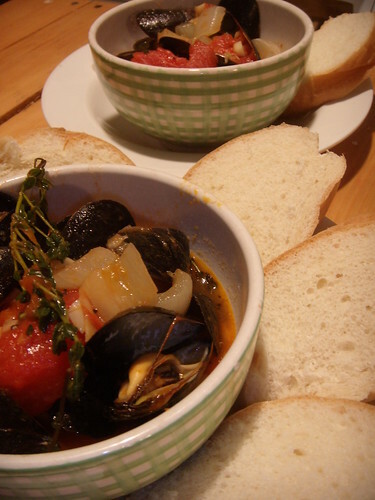 got a pound and a half of mussels for like $6 at manchester by the sea (MA), stewed/steamed them up with some plum tomatoes, onion, lots of garlic, bay leaf, lemon zest, sherry, and fresh ginger and sprigs of thyme...would have been a light meal if we didn't eat two loafs of bread with it!